A petition challenging LEGO Group's recent advertising campaign of its Friends product line is gaining steam faster than a youngster building a skyscraper with the tiny plastic blocks. In less than a month, the SPARK Movement and Powered by Girl petition has generated more than 42,000 signatures and plenty of commentary, with allegations lobbed at LEGO for taking a sexist approach in developing and marketing its Friends product line. SPARK and Powered by Girl are calling on LEGO to "go back to advertising and offering all LEGO to boys and girls." At the center of the controversy is the use of short-shirted girl figurine characters with loads of pink and other pastel coloring in both marketing materials and the product line. Because I am girl who played with LEGOs and I became an engineer. When I was growing up, they weren't boy or girl toys. They just were toys for everyone. Maybe if you showed more girls playing with your toys you wouldn't have to resort to the lame girl sets. We want to correct any misinterpretation that LEGO Friends is our only offering for girls. This is by no means the case. We know that many girls love to build and play with the wide variety of LEGO products already available. 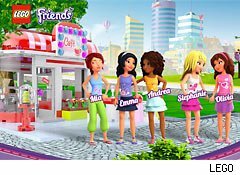 LEGO Friends joins this global collection of products as yet another theme option from which parents may choose the best building experience for their child's skill and interest. The hordes of parents who made LEGO what it is today by buying its products will, in the end, be the ultimate judge of whether the move to introduce and market Friends was a wise one. And it will become clear, not brick by brick, but rather dollar by dollar. Motley Fool contributor Dawn Kawamoto does not own any stock in the companies mentioned.